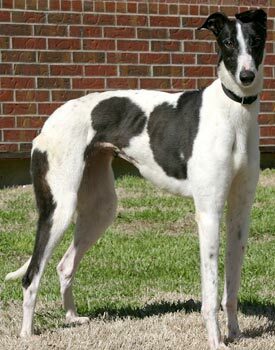 Cookie is a beautiful, 2-year-old, white and black female born February 11, 2008. Her sire is Super Lee, and her dam is Dreamy Babe, making her siblings Sissy and Girlie. 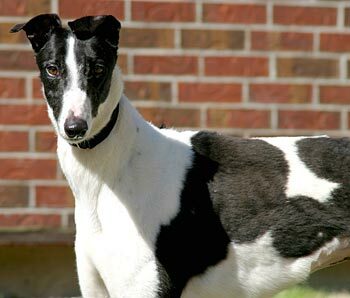 Cookie, like her sisters, was not individually registered with the National Greyhound Association. It was obvious early on that Cookie did not inherit any racing genes from her parents! 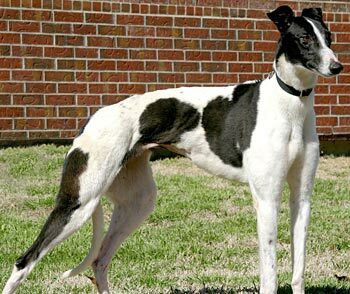 Her black and white markings are most distinctive and unusual. Cookie is not cat tolerant. She will be tested with small animals at a later time. When Cookie first came to stay with the GreyGirls, she was a bit shy and stressed by the dogs and all of the new situations. (Stairs! What the heck are these?? And why are those dogs sniffing me?) She would sometimes respond with warning growls when the girls approached her (to be honest, mobbed her) as if to say – back off, I’m new here and scared! Now that she has settled in, there is never a growl or evil eyes or snarking, not even when a GreyGirl steps over her to move to another dog bed. Instead she’ll bark and play-bow to get someone to play with her. Cookie relishes the company of other Greyhounds and becomes braver when she has a buddy. The word that best describes Cookie in the house is “curious” – this girl wants to see everything that MIGHT be going on. She explores each and every room, navigating through the barriers to see what the excitement is in the kitchen. Cookie even checks out everyone’s crate after they leave (and sometimes joins an unsuspecting Grey in their crate). She’s quiet about her escapades, and will search room to room to room for some unknown prize. One of the things you’ll hear from Greyhound owners is that boys are more affectionate. Well, Cookie must be a tomboy because she’s never more than five feet from her person. She also never gets tired of being petted, and can’t understand why I only have two hands when four would be better to pet her. Cookie has also never met anything she doesn’t like to eat, although she may be reluctant to take it from your hands till she gets to know you. I think she’ll be easy to train since she’s so food motivated. Cookie rides quietly in the car and always wants to go for a ride. She has learned to jump into the back of the SUV but will play on your sympathies to be lifted in if you’re gullible. Cookie has discovered stuffies, and is enjoying chewing them up. She is so fond of them she’ll take them through the dog door when she goes outside. Unfortunately she generally gets distracted and leaves them outside, but maybe she’s airing them out for the next round of chewing. Cookie loves to chase little critters while she’s out in the yard – she will go flying through the dog door if she hears something out there. If you give Cookie a chance to get comfortable in your home, she’ll surely win your heart.